The sentence of Russian businessman Mikhail Khodorkovsky this week is a tragedy that signals Russia’s political corruption. Despite criticism from the U.S. and an appeal on Friday by Mikhail Khodorkovsky’s lawyers, it appears the former head of the Yukos Oil Company will spend as much time in the Gulag as many Stalin-era political prisoners. His sentence of 13.5 years for fraud means that he will not be a free man until 2017, if then. The presiding judge in the case said that correcting Khodorkovsky would only be possible if he was isolated from society. In fact, however, the Putin regime is not concerned about correcting Khodorkovsky. The arrest and sentencing of Khodorkovsky made it possible to complete the transformation of Russia into a controlled society with a permanent political leadership and a president for life (Putin). It is for this reason that Putin not only hates Khodorkovsky but, to a degree, fears him. Putin cannot abide the implicit challenge that Khodorkovsky at liberty would represent. When the Soviet Union fell, almost all property in Russia was in the hands of the state. This meant that it was controlled by government bureaucrats. At the same time, only criminal elements and those who had benefited from the connections to the authorities during the perestroika period and were able to start their own businesses had money to buy it. Khodorkovsky, a young communist league (komsomol) activist, was in the latter category. Like other nascent “capitalists,” Khodorkovsky benefited from corrupt ties to government officials to amass phenomenal wealth. Khodorkovsky acquired the Yukos Oil Company under the “loans for shares” program in which the government mortgaged the crown jewels of Russian industry in return for loans that it was clear would not be repaid. Khodorkovsky’s bank, Menatep, was put in charge of the auction of Yukos which controlled 2 per cent of the world’s oil reserves. It acted to eliminate all competitive bidding and Khodorkovsky purchased the company for $159 million, $9 million above the starting price. In 2003, the value of Yukos was estimated at $15 billion. Khodorkovsky realized that the Russian rules of gangster capitalism had to change if Russia was ever to be a civilized country. Unlike the other Russian oligarchs, who amassed wealth in similar ways, however, Khodorkovsky realized that the Russian rules of gangster capitalism had to change if Russia was ever to be a civilized country and he took steps to transform Yukos into a modern Western company. He declared his income and introduced Western standards of accounting and governance. He also began to exercise the rights of a Western businessman, including the right to finance opposition political parties. It was this that set him on a collision course with Putin. When Putin took power as Yeltsin’s hand picked successor, his first priority was to protect the lives and property of the members of the corrupt Yeltsin oligarchy. Putin, however, changed the rules of the game in one important respect. He was ready to allow the oligarchs to enjoy the fruits of their misdeeds as long as they did not intervene in politics. Putin was to rule alone, without opposition, and the wealth acquired through dishonest means during the Yeltsin era was to be placed exclusively at the disposal of the Putin regime. In 2003, the year of his arrest, Khodorkovsky was defying the rules as handed down by Putin. He was the principal backer of the Yabloko party, the only truly independent liberal opposition party. He also backed the Union of Right Forces (SPS) and out of faith in pluralism, the communists. In October, 2003, Khodorkovsky was arrested. His arrest was preceded by a raid on the offices of Yabloko and the seizure of their computers. With Khodorkovsky’s arrest, the political situation in Russia decisively changed. According to Vladimir Gladyshev, a Russian attorney who served as an expert witness in several Yukos related cases, the Putin regime made it known that from that point on, all financing of opposition parties would have to go through the presidential administration. It would be up to the Kremlin to decide whether a party should be funded or not. In 2007, SPS, which had been funded with Kremlin approval, began to demonstrate an unacceptable degree of independence. It defended Khodorkovsky and stated that the country was moving toward dictatorship. The Kremlin responded by cutting off funds to the party that had been donated by sympathetic businesses. Starved of money for salaries, facilities and advertising neither SPS nor Yabloko gathered enough votes to enter the Russian parliament. In the aftermath of the Khodorkovsky case, the Russian political system became a charade. Without money, the opposition parties were no match for United Russia, the Kremlin supported party which had access not only to all major private financing but also virtually to the entire administrative apparatus of the country. The Kremlin resorted to massive vote rigging in recent elections but it did not have to. The situation was so skewed in favor of United Russia that no opposition party could compete no matter how hard it worked to muster support. Khodorkovsky must now return to the Siberian labor camp where he has served his long sentence with modesty and great personal dignity. His fate is, of course, a tragedy for him and his family. But it is also a tragedy for Russia. Khodorkovsky is the object of Putin’s vindictiveness not for any crime he may have committed but for what he represents. This is not just the corruption of the Yeltsin years but also the hope for a better and more honest future. 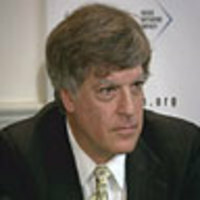 David Satter is a senior fellow of the Hudson Institute and a fellow of the Foreign Policy Institute of the Johns Hopkins University School of Advanced International Studies (SAIS). His latest book, Haunted Ground: Russia and the Communist Past , is due out next year from the Yale University Press.